If you’ve ever been involved in a rear-end collision, chances are you’ve heard the common theory about who’s at fault. Even for people who haven’t been involved, the common perception is that the person at the back of a rear-end collision is always at fault. But did you know there is no actual rule behind this theory? The theory holds true most of the time, but there’s no specific law alluding to this. So how did this idea get started? To get there, we need to answer a few other questions. Who Is at Fault in a General Car Crash? This question might sound silly, but starting here allows us to understand liability in vehicle collision cases. According to the civil liability code for California, the owner of a motor vehicle is responsible for the death or injury in a collision when it results from negligence, a wrongful act, or omission of vehicle operation. So, the person at fault in a car accident is the one who was negligent, had a malicious purpose, or failed to operate the vehicle properly. Let’s apply this to a rear-end collision scenario. Let’s say Car A has stopped at a red light and Car B is driving behind. Let’s imagine that Car B was checking his phone and did not notice the red light. If he was to crash into Car A, he is at fault for failing to comply with the traffic signal and for being negligent to the other driver’s safety by texting/taking his eyes off the road. What Are Some of the Causes of Crashes? Again, this is another silly question. But answering this question can shed light on rear-end collisions. Looking on some common collision causes and applying them to a rear-end scenario can help us determine fault. Violations of rules, signals, and signs. While these causes relate to general collisions, they can easily relate to rear-end collisions as well. For example, let’s imagine a scenario including unsafe speeds. Let’s say Car A is driving at the speed limit with Car B behind him. If Car A were to roll to a stop at a red light, Car B should be able to stop safely, if she is going the same speed limit. However, if Car B is going faster than the speed limit, she might not be able to brake in time, and rear-end Car A. In this scenario, Car B is in the wrong for disobeying traffic laws. Is There Any Situation Where the Rear Car Would Not Be Liable in a Rear-End Collision? The answer to this question is probably the reason why there are no specific laws pertaining to rear-end collisions. The answer, of course, is yes. In certain (not all) situations, the car in front may contain the driver at fault. And how can this person be at fault? Well, the above rules apply to all drivers. Hypothetically, if the driver in front is negligent (or disobeyed laws), he or she could be at fault. Of course, this would have to be proven. Where Can I Get Legal Help? 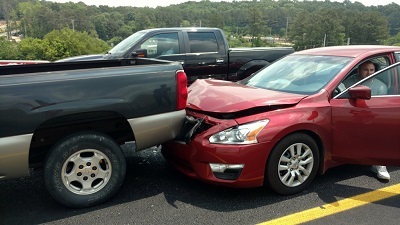 If you or someone you know is involved in a rear-end collision, we may be able to help. Call (888)-454-5569 to see if The Law Firm of Joseph H. Low IV can assist you.